Ngugi wa Thiong'o, the renowned Kenyan novelist, playwright, and essayist, and author of Augsburg's Many Voices text, The River Between, will speak at Augsburg on Tuesday, Nov. 27 at 7 p.m. in Hoversten Chapel. He will be on campus to give a public lecture and do a reading from his sprawling latest novel, The Wizard of the Crow. 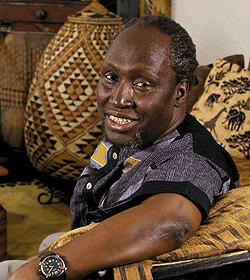 Ngugi has sustained prolific productivity for decades with some 25 books to his name, and at least six distinguished literary awards for his work. In his essays, Ngugi has confronted with remarkable stamina, persistence, and consistency the somewhat intractable question of the role of language in cultural imperialism. He continues efforts to empower the languages of formerly colonized nations in his important role as director of the International Center for Writing and Translation at the University of California, Irvine. Always a champion of the dispossessed and a relentless critic of political corruption in his country, Ngugi lived in political exile from Kenya for 22 years, having survived there a year of detention without trial for his writing and other literary activities. Ngugi's visit is being sponsored by Augsburg's English Department, the General Education program, the Center for Global Education, and the ACTC's Creative Writing Program. The lecture will complement the ongoing 25th Anniversary program of the Center for Global Education, and it is open to the public.